1. Salicylic Acid – a beta hydroxy-acid (BHA) derived from willow bark. Salicylic is lipid soluble and is very effective at getting through the sebum that clogs pores. It also helps to reduce cellular debris and to smooth the skin and has anti-microbial activity so it can help kill off bacteria in the skin. Over the counter products contain low levels of salicylic acid normally because of its natural drying effect on the skin. Look for levels between 2-5% in your products if you actually want to see a rapid and significant improvement in your skin. Caution: salicylic acid has a drying effect on the skin for a few weeks but this generally settles with continued use. For moderate to severe acne 15-30% salicylic acid peels can be done in medical clinics. 2. Follicle plugging (micro-comedones) can be treated with regular exfoliation of the skin. With acne it's worth avoiding mechanical exfoliators that rub and abrade the skin and instead favour chemical ones like glycolic acid, lactic acid, pyruvic acid and mandelic acid. Glycolic acid is a water soluble Alpha Hydroxy-acid (AHA) that is fantastic for removing superficial cellular debris. It doesn’t penetrate very deep into the skin because it's water soluble (lipid soluble ones like salicylic acid penetrate deeper) but it is the most trusted and researched AHA on the market. Strengths varying anywhere from 5-10% are effective for acne without being unduly irritating. Other good options are fruit acids, lactic acid and mandelic acid. Many chemical exfoliators combine a few of these different chemicals to improve the synergy or overall effect. 3. Propionibacterium acnes – This bacteria thrives in an oil rich, follicle plugged environment and the bacteria feed off the excess oil in the skin. Proliferation of the Proprionibacterium Acnes bacteria is responsible for most cases of acne (although we are seeing a few new strains coming through) and it is often resistant to antibiotics used to treat acne. 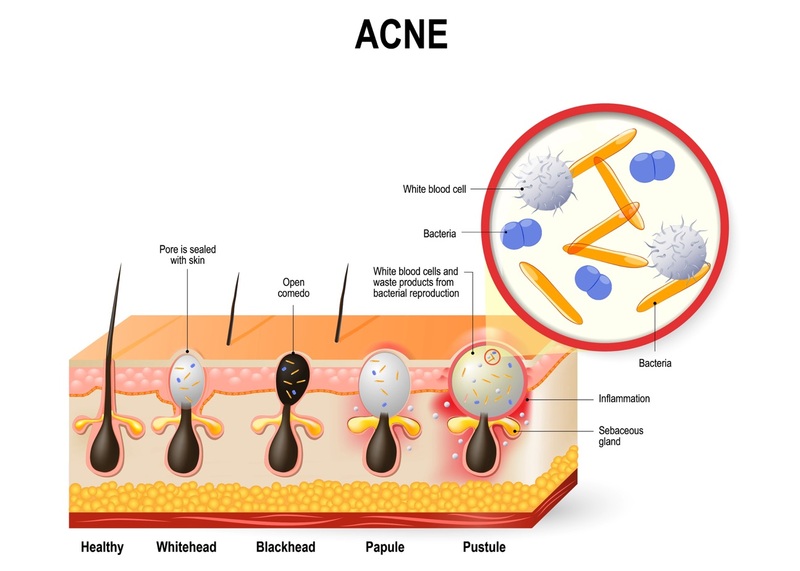 For this reason many physicians are avoiding antibiotics in the management of acne. In addition oral antibiotics can kill off the good bacteria that reside in the gut causing long term digestive & immune problems. Instead of antibiotics, benzoyl peroxide can be used for bacterial reduction and lasers and light therapy can be helpful too. Many physicians are also putting their acne patients onto probiotics to help replace any destroyed beneficial bacterial secondary to antibiotic therapy. 4. Inflammatory cascade – This is a complex process in acne and occurs when all of the above conditions are met – excess oil, microplugging and proliferation of bacteria. The actual inflammatory culprit is lipase, a chemical produced by excessive growth of P. Acnes. The lipase breaks down the oil’s triglycerides releasing fatty acids. And these fatty acids cause the localised inflammation. Retain A products (also known as Tretinoin) are effective at reducing localised inflammation and help improve skin cell turnover. They are also good for reducing the pink/purple discolouration of prolonged inflammatory acne. They are a prescription strength product with good efficacy in most acne patients. Over the counter retinols are a good alternative if you cannot see a doctor and can be used in the long term for maintenance and remission. 0.5 -1% retinol is ideal. Caution: Vitamin A based skincare (retinols & tretionin) can irritate the skin. Use them cautiously, start gently and increase usage slowly as the skin allows. Any initial redness and dryness should settle with continued use. Always avoid heavy and congesting make-up and opt for mineral technology that allows the skin to breathe. Choose moisturisers and sun protectors that are water based and oil free such as hyaluronic acid serums. Products will often guide you on this point by using the term ‘non-comedogenic’ which means that it won't clog your pores.